A lot of establishments, like malls, resorts or hotels, offer free parking spaces for their clients or customers. But even with the number of parking spaces available for a lot of vehicle owners, the demand is still more than what has been provided. Thus, these establishments found another way of generating more income by providing paid parking spaces for their customers. You may also see payment receipt formats. As required by the law, a legitimate business should always provide a receipt to all of their customers who paid for any service. People who have been using pay parking services are well aware of this because every time they come in to park, they are always handed with a parking ticket upon entry and a parking receipt after they make the payment. 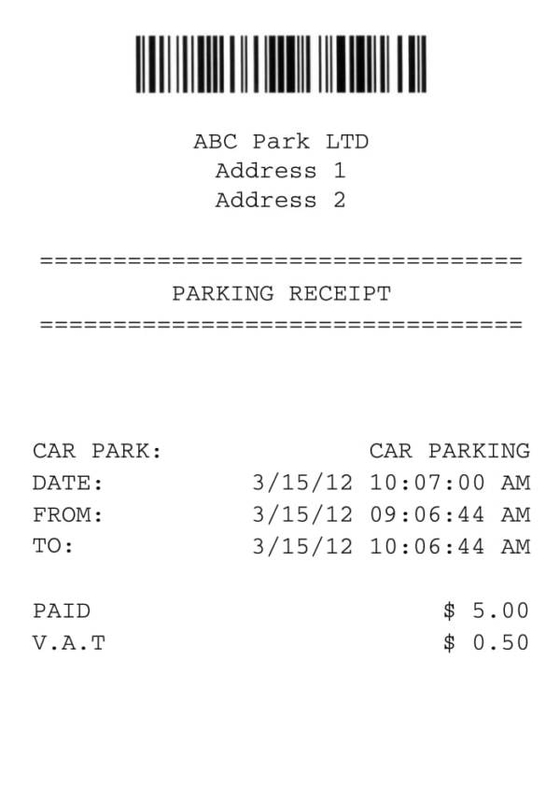 Parking receipts are equally important as other receipts that are used in all sorts of business. Here we will be exploring its many wonderful uses and even figure out how to make one. 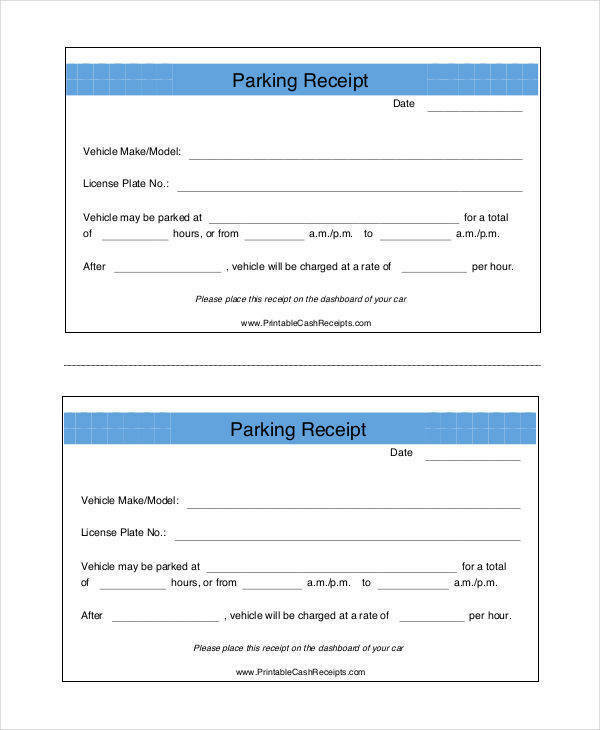 Feel free to check out the samples and templates below to help you further understand about parking receipts. You may also check out receipt of payment letters. What Is a Parking Receipt? A parking receipt is a small piece of paper issued either by a parking attendant or a parking machine to any customer who has parked or used a paid parking space. Upon entry to the parking area, a parking ticket is issued to the customer containing their vehicle’s plate number and the time and date that they have entered the premises. Often, the parking ticket becomes the parking receipt of the customer. It is stamped when they exit or check out as an indication that they have already paid the corresponding parking amount, just like how store receipts are stamped after a customer has claimed some sort of reward or freebie. The parking receipt also includes the parking rules and regulations as well as how the customers are being charged for the parking fee. Some establishments offer a flat rate parking fee and others charge an hourly parking fee. It is very important that parking rules and regulations are printed on every parking ticket or parking receipt as this will guide the customers on what they should and should not do while in the parking area. It is also very important that customers read the parking rules and regulations on their tickets to avoid any untoward incidents from happening. You may also see cash payment receipts. We often believe that a receipt’s purpose and use ends the moment we step out of the establishment where we purchased products or paid for certain services. We think that parking receipts are only important while our vehicles are still parked in the parking area. This may be partly true, but not entirely. You can find out the truth about parking receipts by knowing what they are really used for. You might also be interested in fundraiser receipt templates. 1. 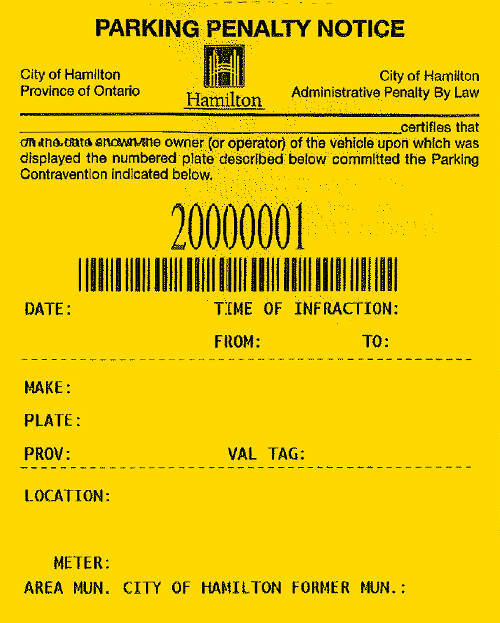 A parking ticket is used as one’s pass to be able to enter and park in a parking area. This is the main reason why customers are provided with a parking ticket upon entry. Without this parking ticket, customers will be denied entry. This could either be because there are no more parking spaces available or the type of vehicle is just not allowed in the premises. You may also check out sample payment received receipt letters. 2. It is used a one’s proof that they have made a payment for the corresponding amount to the length of time that they have stayed or parked in the parking area. 3. Parking tickets always include the establishment’s parking rules and regulations to keep their customers guided on the specific conditions and limitations of the particular establishment. This is important as the parking rules and regulations vary depending on the establishment. You might be interested in rental receipt samples. 4. It is used to determine the number of hours that a vehicle is parked in the parking area which is used as basis of how much they need to pay upon checking out. 5. It records important information such as the vehicle’s plate number, the date and time of entry and exit of the a vehicle. The main purpose of doing so is so that the appropriate amount of parking payment can be made. However, such information are useful in court procedures as a form of evidence of something that is related to a crime. This record may be requested following due process. You may also see sample house rent receipts. 6. The receipt helps in organizing and keeping track of the record of all the vehicles that has entered and exited the parking area in addition to the records taken by security cameras. 7. 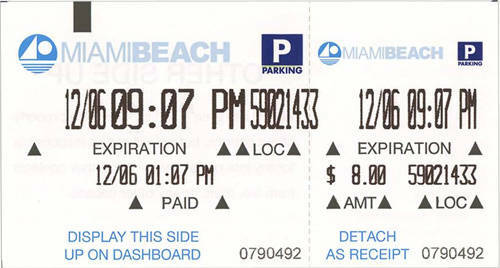 A parking receipt serves as a proof of agreement between the parking provider or establishment and the parking customer. It implies that by accepting the ticket and entering the premises, the customer agrees to pay the corresponding parking amount and follow the parking rules and regulations of the establishment. You might also want to take a look at catering receipt templates. 8. The receipt serves to protect the vehicle owners from theft. The person who has possession of a vehicle’s parking ticket or parking receipt is the only one allowed by the parking attendant to get the vehicle out of the parking area. In short, they are your ticket to legally exit a parking premises. This is mainly the reason why one should keep their parking receipts with them. You may also check out medical receipt templates. 9. The record of parking receipts and parking payments made are used during inventory when it is time to check out the income generated from the paid parking areas. Don’t you just find parking receipts amazing? You wouldn’t have thought that this mere sheet of paper is this useful. If you want to learn more about other different kinds of receipts, then you might just want to check out our website. We have articles that offer free payment receipt samples and printable payment receipt samples that you can download and use. Check them out now! If you can’t find what you are looking for, then the next best thing that you would want to do is to make one on your own. You can’t really get everything you want in life, but you sure can make it happen. And to help you make it happen, here are some easy-to-deal-with steps that you can check out to help you make your own parking receipt. 1. There are many ways on how you can make your own parking receipt. One of them is by downloading receipt templates online that are similar to your needs. These ready-made templates will make it easy and convenient for you to make your own receipt. If you don’t find any templates that fit your needs, then you can very well make one from scratch with the use of existing receipt samples and templates. 2. Once you have decided on the method to use to make your receipt, you will need to prepare for a draft or outline of your desired receipt format. Making a draft or outline is like making a plan before doing the actual receipt. This plan will help you with deciding on what to put on your parking receipt. You may also see sample advance payment receipts. 3. While working on your draft or outline, decide on the logo you will be using, the name of your parking business, the arrangement of the contents, the parking rules and regulations you want to include, and many more. 4. After doing your draft, you will now need to prepare for the necessary materials and equipment to make your actual parking receipt. You may also like loan receipt templates. 5. If everything is ready, proceed with transferring the contents of your draft to the actual sheet or page you will be using as your final output. Do the transfer one at a time and ensure that nothing has been overlooked. 6. When everything has been transferred, review your work again. This is also your opportunity to make revisions and changes to your parking receipt template because it will look just like the template you have imagined it to be. Change and make revisions as many times as you want until you are satisfied with your own work. You may also check out car payment receipts. 7. Finally, save your work and print as many copies as you need. You can also use your saved work to make more copies in the future. Those steps are surely easy to follow. 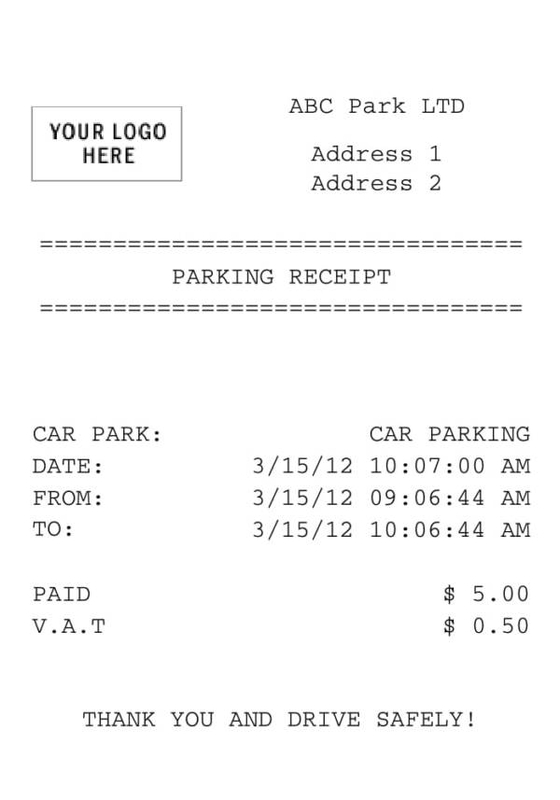 You don’t have to be extra techie or excellent with designing to be able to make your own parking receipt template. You can get help and ideas with the use of existing receipt samples and templates online. You may browse through some of our receipt samples and templates, like order receipt samples and templates and company receipt samples and templates, if you feel the need to gain more knowledge about receipts. What Are the Things Included in a Parking Receipt? 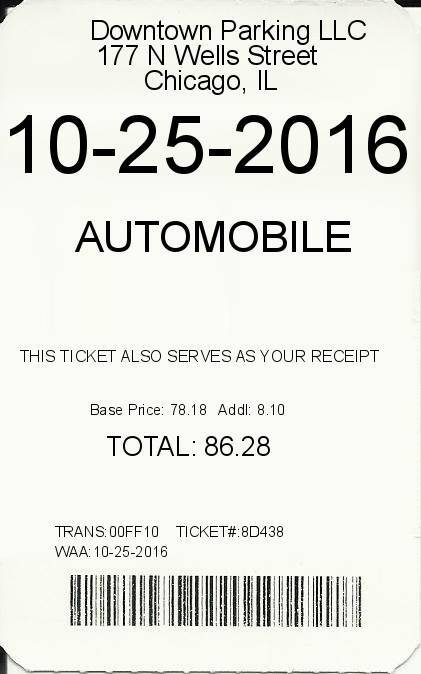 Have you already seen a parking receipt before? If you do, then you probably have an idea on what things are included in these receipts. Every establishment has their own parking receipt and they look different from each other. Unlike the usual store receipts that we always see, parking receipts do not list down any items or products that you have purchased. Instead, it will show you the following set of information. Details such as how many people were in the vehicle upon entry and the name of the driver upon entry are not collected and are not required as they may seem unrelated to the business. Of course, additional information that are not listed above may be included in other parking tickets. You may also see sample rent payment receipts. You should be very careful when handling parking receipts. It may come as a huge problem for anyone who loses their parking receipt. Security personnel and parking attendants are not obliged to remember the faces of every customer and their vehicles and it is also not part of their job. What with the number of different people and vehicles coming in on a daily basis, it’s just impossible to have this done. This is where parking receipts are useful. The receipt itself serves as an identification of the vehicle and its owner. Simply put, if you own the vehicle, then you obviously have hold of its parking ticket. This is how parking attendants are able to tell if you own the vehicle or not. You may also like contractor receipt samples. What if you lost your parking receipt? There are possibly two things that could happen. One, somebody could have intentionally stolen it from you to steal your car. Two, you just really misplaced it and now it is nowhere to be found. Well, both would put you in a really bad situation. If somebody stole it and took away your car, then the only thing that the establishment can do for you is help you report it to the authorities and provide evidence of the theft. You can’t have them responsible for what happened because it’s you who is responsible for taking care of your parking receipt. If you just misplaced it and can’t find it, well, it is still a problem. Some establishments demand ridiculously huge fines for lost or even stolen tickets. You’d be disgusted with the thought of how much that small piece of paper is really worth. You still have to pay for it because you failed to do your part in the general agreement. Now that you know why you need to be careful with your parking receipt, you will be keeping an eye on it in the future to prevent such situations from happening. You may also be interested in other receipt-related topics, like sample business tax receipts, sample car service receipts, and sample cleaning service receipts. When and How Should You Throw Away Receipts? Do you know that it is not always safe to throw away receipts, especially if they contain your personal information? But you just can’t keep them all, can you? They’ll just pile up and become trash that nobody really wants. You have to get rid of them at some point. The tips below should help you when and how you should throw away your receipts. You may also see non-receipt samples. If your simple receipt contains your personal information like your name and card number, which is normal if you have made a credit card purchase, you should not toss it to the trash can like you normally would. If these information get to the hands of fraudsters, then you are really going to be up for a lot of problems. You should first consider if you still need to keep the receipt or not, and for how long. When it is time to get rid of it, have it shredded to pieces using a shredder or have it burned. Just make sure that every part of it gets destroyed. If the receipt you have are those of your jewelry and property purchases, or insurance payments, then you don’t have to think of how to get rid of them. You simply keep them as long as those properties are in your possession or as long as you have claimed all of your benefits from your insurance. You might also be interested in payment receipt acknowledgment. If you have grocery payment receipts and other receipts that you have paid with cash, keep them as long as the items you have purchased are under warranty. When you no longer need them, you can casually throw them in the trash can and not be scared of any identity theft. They won’t show your name or even the last four digits of your credit card or debit card number. Check out more payment receipt samples on our website, like vehicle payment receipts and down payment receipt samples.